If you really want to wipe the slate clean in your kitchen, upgrade to an oh-so-modern backsplash. Even though it may seem like a heavy material, black slate can actually result in a clean, polished, and fresh look that also adds eye-catching texture. Additionally, it tends to be inexpensive and more resistant to staining than marble or granite, which means you won't have to panic if a food fight breaks out. Here are three brilliant ways to embrace a black slate backsplash in your kitchen. 1. Match it to your flooring. Why stop at the backsplash? 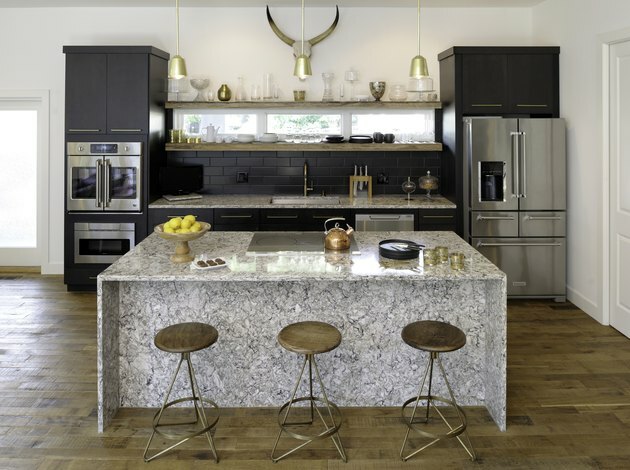 To dial up the drama in your kitchen, consider black slate for both backsplash and flooring like designer Layne Kula. The durable material and dark hue will stand up beautifully to everyday wear and tear. 2. Present a twist on traditional subway tile. Even though we totally love white subway tile, we also equally love it when someone puts a twist on the tried-and-true classic. 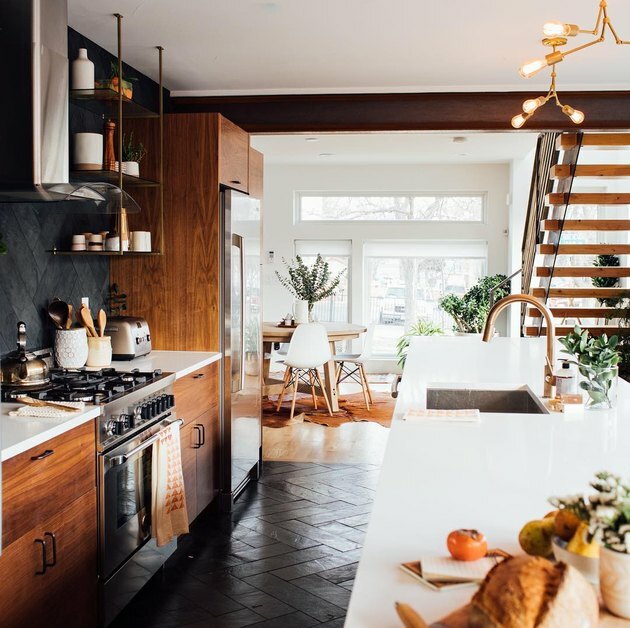 In this kitchen designed by the team over at Savvy Surrounding Style, subway tile takes a dark and mysterious turn to black slate. The backsplash serves as a focal point that ties in the black cabinetry and dark stone veining of the island. 3. Create a herringbone pattern. To punch up the personality of your black slate backsplash, turn to a herringbone pattern — it'll look like an instant work of art. 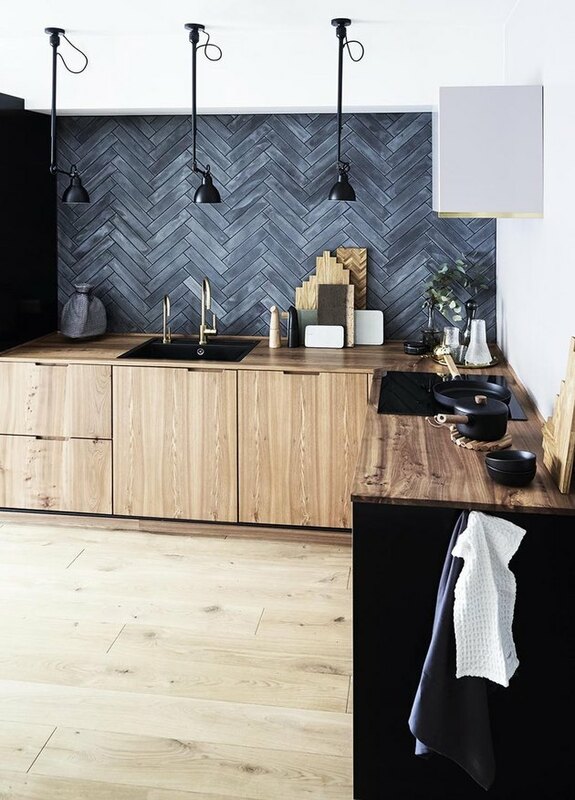 This Scandi-chic kitchen belonging to photographer Anitta Behrendt has flawless style thanks to the dramatic slate tile that meshes beautifully with black accents throughout and striking wood cabinetry. Shelby Deering is a lifestyle writer who contributes to national magazines and websites, including Country Living, Architectural Digest, Well+Good, and more. When she's not writing, you'll find her shopping flea markets or walking around Madison, Wisconsin with her beloved corgi.